After more than 100 rockets were fired from Gaza into southern Israel, Hamas is trying to reach a ceasefire mediated by Egypt. After more than 100 rockets were fired from Gaza into southern Israel over the weekend, the coastal enclave’s terrorist rulers are seeking a ceasefire. According to a report on Kol Yisrael radio on Saturday night, Hamas is trying to reach a ceasefire through Egyptian mediation. Hamas spokesman Taher al-Nunu acknowledged in a conversation with Kol Yisrael said that the terror organization’s Gaza prime minister, Ismail Haniyeh, is handling the contacts with Egypt. Al-Nunu said Hamas is awaiting Israel’s response to the request for a ceasefire, which will be delivered through Egypt. Al-Nunu said that if Israel stops attacking in Gaza, Hamas would be willing to discuss putting an end to the rocket fire. Approximately 135 rockets had been fired from Friday afternoon and until 7:30 p.m. Saturday (Israel time), according to the IDF. 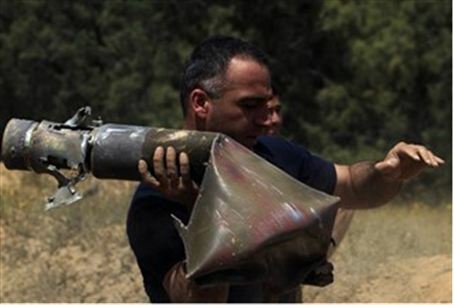 74 of the rockets struck within Israel. The Iron Dome system intercepted the rockets in 28 out of 31 attempts to do so. Eight Israelis have been wounded by the rockets. Most suffered light to moderate wounds. One, a foreign worker, was seriously injured on Friday evening and was taken for treatment at the Soroka Hospital in Be’er Sheva. The escalation in the rocket and mortar attacks began after the IDF hit and killed several Gaza-based terrorist gangs, including a senior leader of the Popular Resistance Committees terror group. Shortly before 5:00 p.m. (Israel time) on Friday afternoon, IAF aircraft struck and killed the head of the Popular Resistance Committees, Zuhir Musa Ahmed Qaisi and his deputy, in a precision attack highlighting Israeli intelligence resources in Gaza and its efforts to avoid civilian casualties. Qaisi planned and led in recent days a terrorist attack against Israeli targets on the Israel-Egypt border, the IDF said in a statement. The terror attack had been in its final preparation stages when Qaisi was struck and killed, the statement added. Qaisi was one of the planners of the attack on Highway 12 near the border with Egypt in August of 2011, which killed eight Israelis, and was also involved in the firing of rockets at southern Israel, according to the IDF. Shortly after 8:00 p.m. (Israel time), the IDF struck two additional terrorist cells, one in central Gaza and one in northern Gaza. According to reports in the Israeli media, two terrorists were killed in this attack, both from the Islamic Jihad. Due to the escalation in the region, the Civil Defense (Home Front) Authority announced that schools will be closed Sunday in southern Israeli communities located between 7 and 40 kilometers from Gaza, including those in Be'er Sheva, Ashdod, Ashkelon, Kiryat Gat, Kiyrat Malachi, Yavneh, Ofakim, Netivot, Sderot, Gedera, Lakiyeh and Rahat will be closed. So will schools in the Hevel Yavneh, Gederot, Bnaya, Kidron and Gan Yavneh, but not Mateh Yehudah, Nahal Sorek and Brenner regional authorities. Fortified schools in the Gaza Belt communities close to Gaza will be open. Gatherings of over 500 people in one place are forbidden. This includes performances, soccer games, etc. There are no restrictions on attending nonessential workplaces or going to shopping malls. Prime Minister Binyamin Netanyahu spoke with the heads of the councils in the south that were fired at (Be’er Sheva, Ashdod, Ashkelon, Kiryat Malakhi, Gan Yavneh, the Eshkol Regional Council, the Sha’ar Hanegev Regional Council and the Bnei Shimon Regional Council). He asked the council chairmen to convey to residents his esteem for their fortitude. The mayors noted the security that the Iron Dome system provides to their residents. Prime Minister Netanyahu said, “We will continue to hit whoever plans to attack citizens of the State of Israel. At the same time, we will continue to improve home front defense."